Flappy Bird, the mobile game that became an overnight success will soon disappear from the app stores. So if you want to see what the fuss is all about, download it soon! It’s not entirely known why he has decided to do this, he has stated it is not for legal reasons. Perhaps, like Phil Fish, he simply doesn’t like the negative attention and impact on his life that having a successful app can bring. Still, he says he will continue to make games, so I wish him the best of luck! King, owners of the immensely popular Candy Crush Saga issued a statement defending their action to file opposition against Stoic studio’s attempt to trademark ‘The Banner Saga‘ – the title for their game. This comes after the news that King have been granted trademark for the word Candy- and have their eyes set upon Saga too. It is somewhat ironic perhaps that the dictionary definition of saga- ‘a long story of heroic achievement, especially a medieval prose narrative in Old Norse or Old Icelandic’ applies more directly to a game about a Vikings than one about swishing candies around and aggressive in-app purchases. However, this seems to be in direct conflict with their Notice of Opposition. The whole thing is a bit of a mess to say the least. For full details, check out the rock, paper, shotgun article which covers the issue in much more depth than I. Copyright and trademarks are treacherous waters to navigate. When companies can trademark colours, simple words and everything in between, it can be a minefield for smaller Indie devs, to not tread on the wrong toes, so to speak, is tricky indeed. Lamentable as the situation is, often money talks and big businesses can afford the legal wrangling necessary to go after and attain their goals. The law, is, after all, the law. In response, a new Indie Game Jam has been set up to promote the issue and show their support. The Candy Jam will run until Feb 3rd. Sony has announced it’s plans for Playstation Now – a cloud gaming service that will allow users to stream games. The concept behind cloud computing is simple- rather than require the end user to own and maintain high-end hardware, all the processing is done on a server farm and the result is streamed back to the user. This means that the user’s device need not be powerful at all- you could, as Sony intends, get Playstation 3 quality visuals on a basic tablet! With streaming services becoming more widespread, and the average speed of a home users connection rising, we could be seeing the second coming of cloud gaming. With Sony backing their own service, I’ll be interested to see how well the technology works. Cloud computing, in its true sense (rather than simple cloud storage ) has always seemed like a good idea but has so far met limited success in reality. If we can, in the near future, play games like The Last of Us on our smartphones or tablets, that opens up a whole new avenue for gamers. Sony also intends to use the service to enable PS4 users to play PS3 games on their system, a feature currently unavailable. it seems the world is taking note- GameStops stock value fell by over 8% following the announcement. Testing of the service is due to begin at the end of this month, with plans to launch the service by mid 2014. Well, here we are folks! 2013 is officially history and we’re into 2014! Just one more year until we have self-drying clothes, auto-lacing shoes and hoverboards! Here’s to an auspicious new year, may good things happen for us all! Yup, it’s that time again folks – more PC games available at ridiculous prices. From the 19th December through ’till the 3rd January, Steam will be offering their own brand of festivities through daily deals and flash sales – changing every 8 hours. Want to get a few digital gifts for gamer friends, or just treat yourself to that game you’ve been wanting but the holiday season has left your wallet aching? Nows your chance! A prank infographic that originated from the infamous /b/ section of 4chan can permanently ruin your brand new Xbox One. 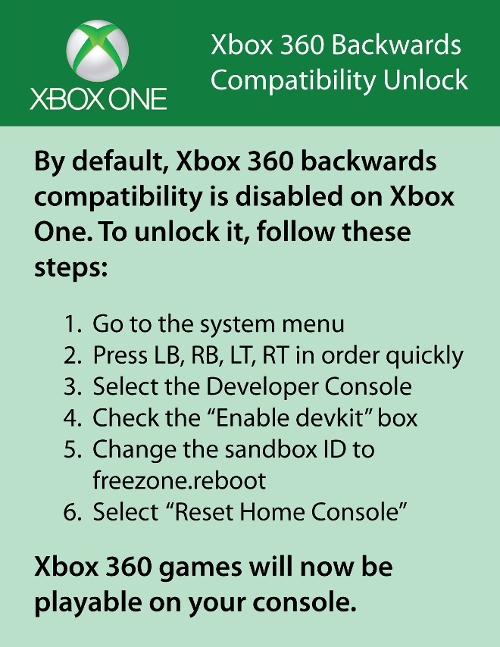 The prank, which originates from the random section of 4chan, famed for it’s rogue users and often explicit content, gives instructions to users that claim to enable backwards compatibility on the system, a feature that many users want but is not available on the next-gen console. However, following the instructions will ‘brick’ your console – rendering it inoperable. The Xbox One has faced severe criticism since its announcement and followed a rocky path to release. This is another bump on the road for the software giant and it’s new flagship console.